Our disappearing screen doors are unique because they can be mounted inside the doorframe or on the surface of the interior or exterior molding. Our retractable screen doors Were specifically designed for ease of use and durability. Custom cut to fit your need then installed by our specialist. 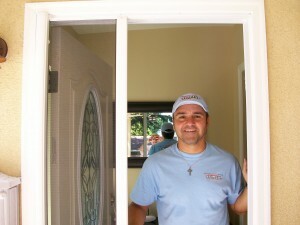 Your just a phone call away from owning a beautiful retractable screen door! Mobile Service in the following areas: Agoura Hills, Bel Air, Bell Canyon, Beverly Glen, Brentwood, Calabasas, Canoga Park, Chatsworth, Encino, Granada Hills, Hidden Hills, Malibu, Mission Hills, North Hills, Northridge, Oak Park, Porter Ranch, Reseda, Sherman Oaks, Simi Valley, Studio City, Tarzana, Thousand Oaks, Topanga, Van Nuys, West Hills, Westlake Village, West San Fernando Valley, Winnetka, Woodland Hills, Wood Ranch, Valley Village.